A tea party? An old photograph and a dusty trunk in the attic? How exciting! Their adventure starts in the attic where Mimi leads them to a dusty old trunk. What will the girls find inside? Everything they need to host the best tea party ever! Julie A. Santers was born and raised, along with her older brother, Jack, and her younger brother, Jim, in small towns sixty miles west of Chicago, Illinois. Julie and her husband, Paul, moved to eastern Pennsylvania in 1986 and remain there today. Although the move to Pennsylvania led her to a fulfilling career with a large financial institution, Julie was always dabbling in writing stories. 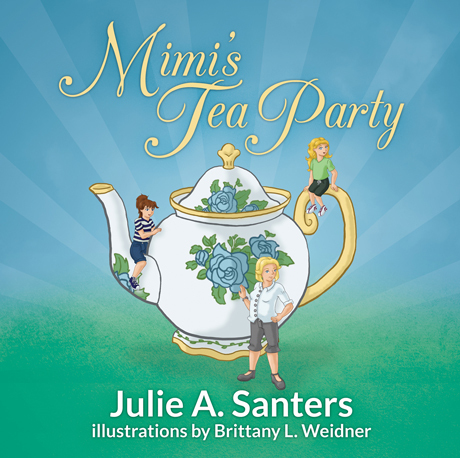 For years her hand written children’s books sat on shelves in her home until she was finally encouraged to get Mimi’s Tea Party published. Along with her illustrator, neighbor, and friend, Brittany, the journey to publication was enriching, satisfying and rewarding for Julie. She is certain she will pursue sharing more of her treasured books with the public in the future. Brittany L. Weidner grew up in a small town in Pennsylvania. As a child she enjoyed books and loved watching Disney Sing-A-Long Songs. Once she tapped into that world of imagination there was no turning back. It didn’t matter what form art took, dancing, drawing or even sewing, Brittany had to try it all. After throwing herself into whatever art classes she could in high school, she went on to study at the Art Institute of Pittsburgh as a Media Arts and Animation major.